St. Mary Goretti School marks its 11th Anniversary with a week filled with various exciting and challenging events. To start off the celebrations, students from the two campuses will be competing against each other to prove who is better in its academic, cultural and sports events. A battle of the brains will ensue as students compete in the academic competition where quiz bees in English, Science and Math will be held. Flair for the arts will also be exhibited in the cultural events, namely, the Speech, Pageant, Singing and Dancing contests. SMGS students will also show that not only do they have the brains, but the brawn as well, in the sports events that include basketball, tennis, badminton, track and field and chess. Three SMGS Kalookan students were given awards on the recently concluded CAT I Quiz Bee and Singing contest held at the Manila Central University. Twenty schools around Metro Manila took part in the event. SMGS students of Kalookan Campus won several awards in the 6th Season of Interschool Basketball Volleyball League (ISBVL) held at the St. Joseph College of Novaliches, Kalookan City. Winners are Tanon and Homol who grabbed 2 awards each. 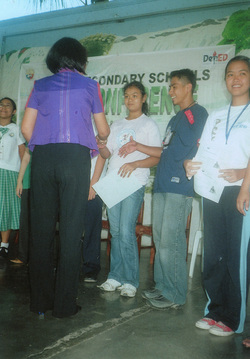 Pauline Joy Ipac and Jamille Lopez garnered medals in the Secondary Schools Press Conference-Division Level. Held at the Sampaguita National High School, Kalookan City from 12 to 14 November, Ipac won 2nd place in Photojournalism, Filipino category while Lopez won 8th place in the English category. Out of 35 participant schools from the City of San Jose del Monte, Bulacan, SMGS Bulacan grabbed 5th place (overall) in CSJODEMPRISA (City of San Jose del Monte Bulacan Private Schools Association) Academics Meet '08. Congratulations to the students and teachers for a job well done!